So, you’re looking forward to your next job interview and, obviously, you want to make the right impression. Even if you’re the best candidate for the job, it’s important to “dress to success” too. The suiting is of great importance, but if it isn’t paired with the right footwear, it’ll easily lose the winning effect. Right now, I’ll focus on women and the right footwear for their job interview. It’s rather difficult to define what’s the best footwear for the job interview. If you’re a movie star, stilettos are alright. If you’re a fitness trainer, gym shoes are the best choice. But, are running shoes or sky-high heels really the right choice if you’re going to work in an office? Probably not. Stained and tattered shoes will in any situation signal that you’re not truly investing in the meeting. First of all, footwear should be in proportion to your frame. If your frame is petite or smaller, don’t wear shoes that are too thick or heavy soled, because the attention will be drawn to your feet. On the other hand, if your frame is larger, pick the shoes that are more delicate in order to balance things a little bit. No matter if you’re wearing non-leather or leather shoes, they should always be clean, polished and sprayed with protector. Salt or grass stains, as well as other debris, is unprofessional and unacceptable on your shoes. In case you’d wear those shoes to the grocery store or when clubbing, chances are, they aren’t suited for an office environment. The length of the heel is the most common mistake women make when picking the footwear for their job interviews. If you’re looking for a professional look, make sure you limit your heel length to 3 inches tops. If you go above, you’ll look like you’re going to the party. Nevertheless, a small heel is necessary if you want to look like you’re dressed for a business. 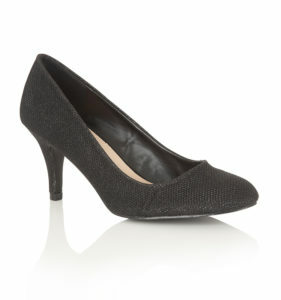 Having a good pair of black 2-3 inches shoes is a must; they will work great in a variety of situations and settings. If you simply can’t or don’t want to wear heels, opt for an alternative, such as “kitten heels”; they are business appropriate without being too high. Also, a ballet flat in a neutral color can do the trick. When it comes to summer footwear, open-toed shoes can be considered as office appropriate, but it depends on the organization. Nevertheless, the open-toed summer footwear isn’t appropriate for the job interview.